Lopaze poses with his bike before he started off on a guided bike tour with Art of Bicycle. What has surprised you the most about India? I don’t know if I’ve been surprised, at least not exactly. It’s hard to separate what is surprising from the things that require a double take only because it’s different. My only expectation before the trip was to be exposed to a foreign culture, and that expectation has been met. 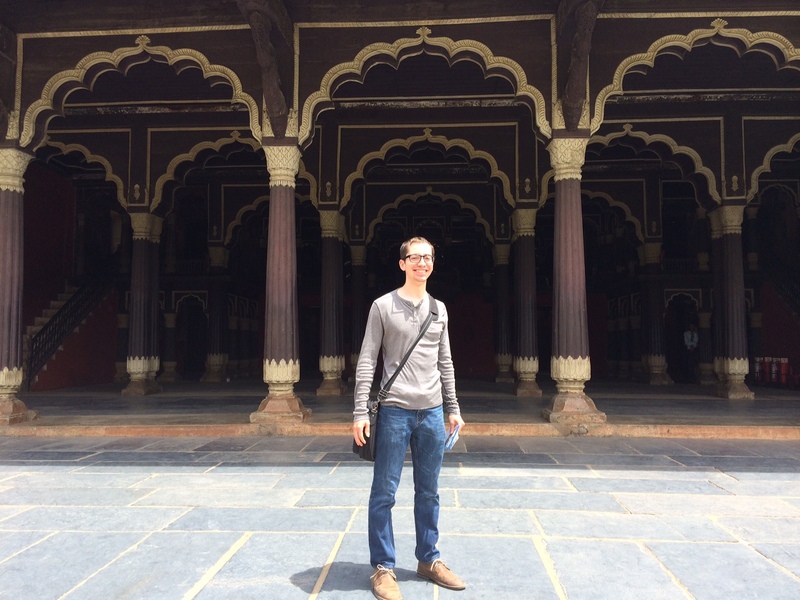 Before I arrived in India, I heard a lot about the things I would see. So I wasn’t surprised to see cows roaming the street, blocking traffic. But hearing about it, knowing about it, is different than being here and seeing it. I don’t know if there’s a word for it, but it is akin to surprise. Surreal, maybe? Although that word doesn’t seem exactly right either. What surprised me the most, or came close to it, was the kindness of the people here. For the most part, I’ve been treated with respect and friendliness. The people have been very welcoming and accepting. I don’t want to go into sweeping generalizations about the Indian national psyche as if I know everything there is to know about it after spending seven weeks in one particular Indian city. But in my experience, they warm up quickly to strangers. I would meet a new person at my lodgings, the Taj Mahal Luxury PG, and then the next day they would come to my room to hang out, invite me on evening walks, or ask for informal English lessons. Some of my friends have told me Indians get attached quickly, and they draw energy from each other. Family and friends are the most important thing to them. It is a community-oriented culture, and they rely on each other. People have been curious and inquisitive, wanting to know all about me, and all about America. The one exception to this Indian generosity of spirit is the hostile, selfish motorists on the roadway. Drivers show each other no mercy. Their vehicles fight for every inch of roadway, constantly honking at each other. In a traffic jam, motor bikes and autorickshaws try to worm their way past gaps between cars and larger vehicles like trucks. I don’t know why, because moving forward a foot or two hardly seems like significant progress to me. At certain crossings, gangs of cars and motorbikes will accumulate. Once the group reaches a certain size, the members will begin to inch forward into moving traffic together as one, forcing traffic to stop. It reminds me of a school of fish in the ocean. The traffic is terrible here. I could rant about it for a long time. But I’ll stop here. My biggest challenge has been comprehending accents and interviewing people who speak limited English. Most people speak English; some speak it very well, so I don’t need a translator. But English is not always the mother tongue of everyone I interview. You can understand why this would pose a problem since accuracy is crucial in journalism. It does not help that I only know basic phrases in Kannada, and no Hindi or Tamil or Telugu (three of the other most common languages), certainly not enough to communicate well. When I interview a person, and English is not the language they speak best, I can sense they aren’t speaking as fluently or as precisely as they would in their most natural language. So I have to ask a lot of clarifying questions, or have people repeat what they said to make sure I understand them. There’s some nuance and context lost as they mould their thoughts to fit into the English language. On the flipside, I’ve had locals tell me they have trouble understanding my American English accent. Language barriers are a two-way street. The second most challenging aspect of reporting in a foreign country is figuring out whom to interview for each story. I’ve had to rely on editors and other reporters to figure out the best sources to speak to, and where to find certain information. I, on some level, knew intuitively whom I would need to speak to about certain topics in the states. What successes have you had so far (even if it as small as a successful trip to the grocery store)? When I first arrived in Bangalore, I felt like a fish out of water. My largest success has been adapting to the way of life in a foreign country. At first, everything was disorienting. The environment was filled with unusual stimuli: the humidity, the incessant honking of horns, the aggressive driving, the unfamiliar languages—Kannada is the official state language, but Hindi, Tamil, and Telugu are all spoken by some of the more than eight million citizens of Bangalore—, the confusing road layouts, the feral dogs and cows roaming the streets sometimes blocking traffic, the odour of human (and animal) waste. Those were my first impressions, things that stood out like a sore thumb. It was difficult to accept this new status quo. But I knew I had to move past what was familiar and comfortable, and embrace the differences. One of the goals of the Foreign Intrigue program is to promote tolerance and respect for other cultures. It wasn’t always easy to keep an open mind, as some differences have and still do rankle me (like the unnecessary honking and awful traffic), but I think I’ve succeeded in setting aside my yearning for the familiar. Now, especially looking back at my state of bewilderment in the first couple weeks, I’m surprised at how I’ve acclimated to the city. It all feels normal, routine even. I didn’t think that was possible. Lopaze stands in front of Tipu Sultan’s Summer Palace, a famous landmark within the city. Can you share an anecdote from your trip—cool adventure, funny incident, lesson learned? 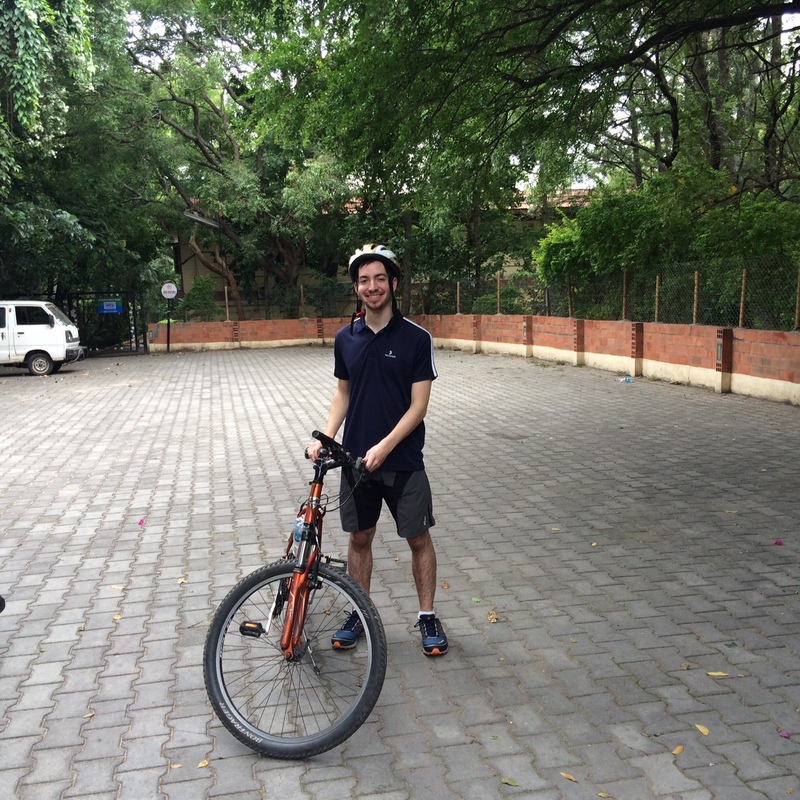 1) I went on a guided bike ride to the Bangalore countryside a couple weeks ago, and it is my favorite memory so far. I wrote a blog post about it for my publication if you would like to read it for more in-depth information. I’ll add this even though it is redundant if you read the blog post. The oddest thing about the trip was seeing how schoolchildren reacted to our appearance, for two reasons: I was a city-dweller and a foreigner with a light complexion. They don’t see many of either group in the countryside. Maybe you’ve heard how locals in some parts of India will ask foreigners if they can take a photo with them because it’s so rare to see a foreigner. I did not have my picture taken, but the schoolchildren would wave and babble excitedly. 2) I stay at a Paying Guest facility here, the Taj Mahal Luxury PG. I don’t know what it has in common with the Taj Mahal or luxury. Anyway, the Taj Mahal offers breakfast and dinner on the weekdays, and breakfast, lunch, and dinner on the weekends. The first night, I had to borrow a plate to eat dinner, which was a serving of rice with curry, some kind of dal, and pulka (bread). They did not have any silverware for me to borrow when I asked. As it was the first day, I had not yet been to the mall to purchase some items I needed such as silverware and a bowl. I had to eat my meals using my hands. I felt embarrassed as I sat at the table, which was set up in the garage area. I thought the people around me must think I lack manners, but then I realized everyone was eating without silverware. While in the U.S. rice is not considered finger food, it’s perfectly appropriate to eat rice using your hands in India. My co-workers also eat using their hands of what would not normally be considered finger food. Maybe it’s not appropriate at restaurants, but it’s certainly accepted at home or work or PGs. 3) Body language is not as universal as I thought. I was confused the first time someone shook their head—a gesture I associate with a negative response—but then they proceeded to verbally express agreement. The headshake is an exception. Most gestures have the same meaning here as I’m used to in the states. 4) My friend Gautham will often grab my shoulder and pull me in close if he wants to tell me something, clutch my wrist randomly when talking, or rest his hand on my shoulder in greeting. It’s as if he wants to express his affection through touch. He completely ignores the concept of intimate, personal space. I understand it’s a cultural thing, but I initially reacted by shrinking away from the contact, only because it was unexpected. I’m still not completely comfortable with it. 5) I went to a gift shop to look for souvenirs. When I entered, the shopkeeper said hello. Then the next question he asked me was if I was a Christian. I was taken aback. Why did he want to know? It was not relevant to whether I would buy his goods or not. At first, I thought it was rude of him to ask such a personal question, especially since religion is a volatile topic for some people. I told him I was agnostic—a concept I had to explain to him and others who have asked about what religion I followed— and then he encouraged me to read the Qur’an to find all the answers I seek. He wasn’t judgemental, and seemed sincerely interested in helping me out. I wasn’t offended. I know he had good intentions. But when I walked into the store, I was not expecting a proselytizing shopkeeper. 6) I was sitting in a waiting room, waiting to interview a person, and the man next to me asked where I was from. I told him I was from Seattle. He asked me about the origin of the name of Seattle. I started to tell him the city was named after an Indian chieftain, but I realized as I said “Indian” that it might cause confusion. He would naturally assume I was referring to someone from India, not a Native American. I have Christopher Columbus’s botched identification of the natives he found in what is now known as America to thank for that peculiar moment. 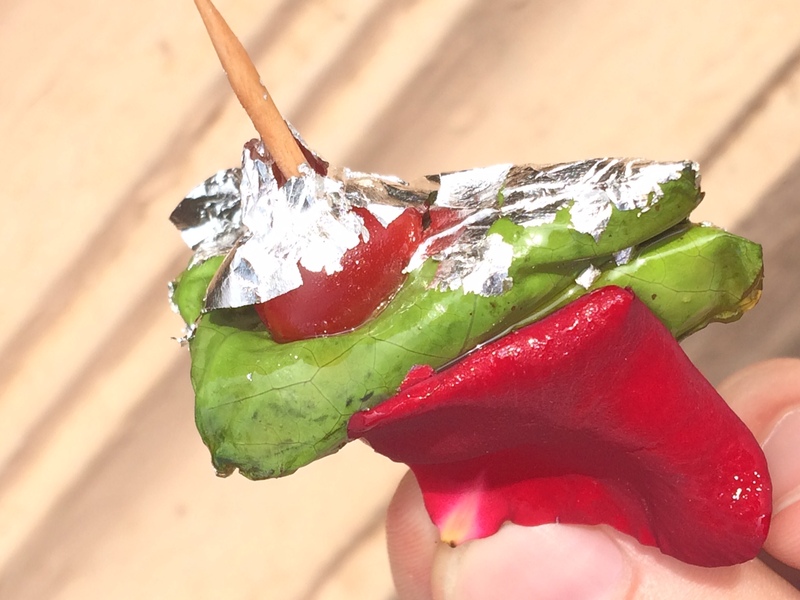 “Maghia Paan, a sweet treat you can find on the street. It’s chewy, minty and the aftertaste reminds me of gummy candy like Dots,” Lopaze said. What are you looking forward to the most as you continue your stay in India? I was acutely homesick the first couple weeks I was here. I felt isolated. I felt like a foreigner in a strange city and culture, and I was. After recovering from the initial culture shock, I’m looking forward to moving past the surface level differences and feeling as if I belong here. I’ll be here to celebrate the Hindi celebration of Ganesh on August 29. It is the first Indian festival I will be able to attend. I’m also looking forward to travelling outside of Bangalore. I’m going to the popular tourist destination of Goa (famous for it’s beaches) this weekend. I’m also planning on visiting Hampi, known for its bazaar and its temples, in a couple weeks. And I’m looking forward to spending more time with my friends here as my sojourn in Indian nears its end. My privilege bubble was burst. I have seen just how privileged I am to live in a developed country like the U.S. and to be given the opportunities I have. People from developed countries should visit a developing country. It doesn’t have to be India. There’s no better way to illuminate your privilege then witnessing how the unprivileged live. My visit here has given me a new perspective. I didn’t consider minor things like pressured showers as luxuries, but I do now. I bathe using a bucket bath in India. A couple weeks ago at an Ayurverdic retreat, I took a shower with a showerhead with water pressure for the first time in a month. To say it was the highlight of the trip is only a small exaggeration. The water pressure felt as if it was an extravagant luxury, but it was just a shower. Back home, it’s an everyday activity I took for granted. Not anymore. One last thing: The first couple days, the culture shock was enough to make me fantasize about catching the soonest flight back to America. But the more time I’ve spent here, the fonder I’ve grown of Bangalore, and all the intricacies of the culture. I’m going to miss India when I catch my flight back home—except for the traffic.